According to this article in The Atlantic, a new study by “Stanford researchers” tries to take a look at the effects that sales tax would have on online shopping. The study, “out this week on the National Bureau of Economic Research, looks at how sensitive online retail is to tax changes by tracking the behavior of eBay users.” It doesn’t include real estate and auto transactions. But the same sales tax you pay locally is already due online. Nobody is suggesting raising sales taxes, online or otherwise—certainly not differentially. So what does this study really tell us about online sales tax collection? Not much. It doesn’t take a team of economists to tell us that an increase in sales tax rates causes a decrease in sales, at least temporarily. Thank goodness raising sales tax rates isn’t on the table. We were also very curious about how the team got the eBay data they used for the study. As our regular readers know, eBay is on record as opposing online sales tax collection—is it possible that they sponsored or otherwise supported the study in the hopes that it would add fuel to their argument? The paper is very upfront about pointing out potential conflicts of interest. 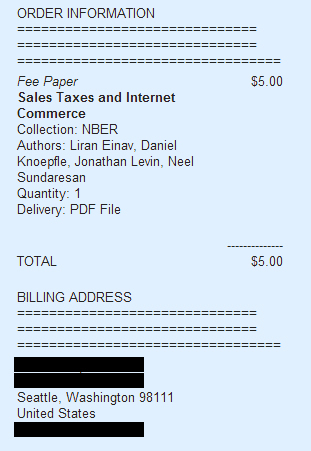 One of the four authors, Neel Sundaresan, is Senior Director for eBay Research Labs and is employed by eBay. Another of the authors is Professor Jonathan D. Levin, Chair of the Department of Economics at Stanford University, who was a paid consultant to eBay Research Labs in 2010 and 2011. Don’t misunderstand the point of our post—we would love to see a study that truly looks at the actual effects of online sales tax collection on online shopping. Unfortunately, this isn’t it. Out of all the transactions data they had access to (all transactions from 2008 to 2010), how many transactions included sales tax? Out of all the sellers represented in the transaction data, how many sellers conducted more than 200 transactions or had over $20,000 in sales in each of the three years? Similarly, how many sellers exceeded $50,000 in sales in each of the three years? Finally, how many sellers exceeded $150,000 or $500,000 in sales in each of the three years? Given the intensity of debate around this issue at the local, state, and federal level—particularly around these two points—it is unfortunate that the researchers missed (or avoided) the opportunity to provide such insight. eBay relaxing opposition to the Marketplace Fairness Act? It all started when Maine’s Governor Paul LePage sent a letter to Maine’s Senators Snow and Collins, urging them to support the Marketplace Fairness Act (S.1832). Then, we learned (from an article by Jonathan Riskind, Washington Bureau Chief for MaineToday Media) that eBay had written a response letter to Governor LePage. Yesterday, eBay announced/confirmed this letter. We are happy to note that eBay did not write in opposition to the Marketplace Fairness Act but instead simply confirmed that small business retailers should be adequately protected from new burdens (which is already provided for in the bill). We could not find this quote in eBay’s Letter. We also wrote a letter to Governor LePage regarding his support of the Marketplace Fairness Act and eBay’s reported objections to it, which we sent yesterday (before eBay released their letter). California is on fire (for sales tax)! Earlier today the California Assembly passed AB 153, the so-called “affiliate nexus” legislation. This development comes on the immediate heels of the Assembly’s approval yesterday of AB 155. AB 153 would require any out-of-state retailer to collect California sales tax if that retailer pays click-through commissions to any California business in excess of $10,000 $500,000 annually (note: revised upward 3 days ago). AB 153, if approved by the State Senate and signed by Governor Brown, will mandate that any website link advertisement (where compensation is paid if a sale is completed) is the legal equivalent to a door-to-door salesperson—invoking the sales tax collection obligation provisions of the Supreme Court’s 1992 Quill decision. As many of our regular readers know, many web-based businesses regularly display commission-bearing advertisements on their websites. Perhaps more troubling than the typical “Amazon.com” affiliate relationships that have been in the news so much lately, consider the possible impact of this legislation on California companies, such as eBay. 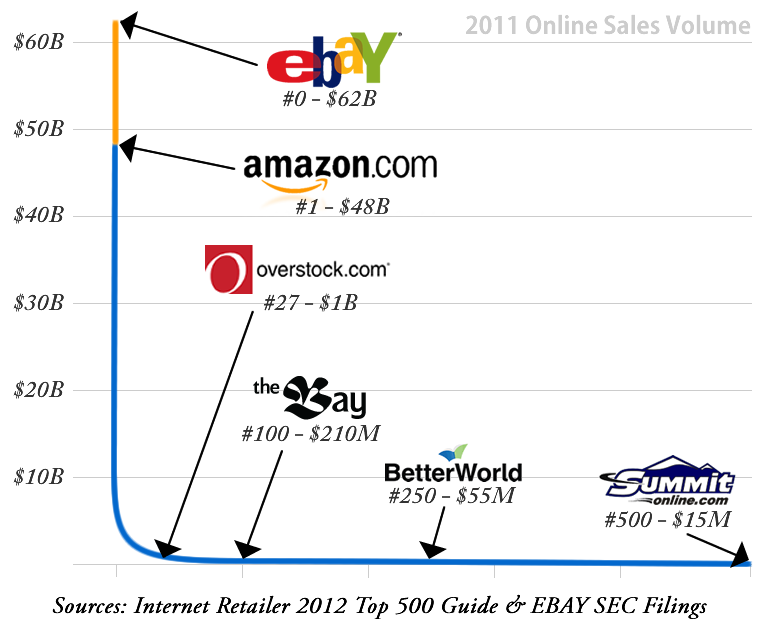 EBay’s entire business is based upon receiving a commission upon completed sales. If AB 153 becomes law, potentially every eBay seller could be required to collect California sales tax if they sell (or even market) any products to just one California resident. We expect this may explain the sudden huge jump in the “occasional sales” exception threshold. Seriously though?! Is $500,000 annually really an “occasional seller“? That must be one heck of a garage sale! Meanwhile, AB 155 is now focused entirely on mandating that so-called “sister companies” based in California establish sufficient nexus for out-of-state “parent” or “sibling” companies to be required to collect California sales tax. Our regular readers may recall that AB 155 was initially introduced as reporting requirement bill, very similar to Colorado’s legally embroiled reporting requirement law, HB 1193. Fortunately AB 155 has been amended several times since then to eliminate the more troublesome reporting obligations and achieve its new form. Although, as it is worded now, it would seem quite likely to cause affected out-of-state retailers with investments in California businesses to simply withdraw those related entities from the state entirely. While we are sure there are numerous examples of such entities, Lab126 (the developer of the Kindle for Amazon) comes immediately to mind. While we appreciate and respect California’s need to fix the current imbalance related to sales tax collection obligations, which costs the state over $1.1 billion annually, we sincerely hope those entrusted to do the people’s work in Sacramento recognize that this matter must ultimately be resolved in Washington DC. the many variations in rates of tax, in allowable exemptions, and in administrative and record-keeping requirements could entangle National’s interstate business in a virtual welter of complicated obligations to local jurisdictions. So, unless and until California directly addresses these three points of undue burden, attempts to compel remote retailers to collect will not likely survive litigation and judicial review. Fortunately, California has been working with 43 other states on the Streamlined Sales and Use Tax Agreement since 2000 —a system that alleviates all of these burdens (and is FREE for retailers to implement). Governor Brown and the California legislature should urge California’s delegation in Congress to sponsor and work to pass the federal Main Street Fairness Act, which would eliminate the need for California to venture into such controversial interpretations and extensions of the concepts of nexus and would finally enable California to require out-of-state retailers to collect sales tax, just as any local retailer is required to do. There was a press conference in Washington DC today about The Main Street Fairness Act, a bill introduced by Congressman Bill Delahunt (D-MA) on July 1, 2010. The bill aims to help states retrieve billions of lost sales tax revenues that are currently owed but go uncollected on remote (online and catalog) sales. Rep. Delahunt was joined by South Dakota Governor Mike Rounds (R-SD), Former Speaker of the Iowa House of Representatives Chris Rants (R-IA), state leaders and small business owners. Here is the Press Release on Rep. Delahunt’s website. Coverage of the press conference is included in this Washington Post Article. FedTax.net CEO R. David L. Campbell was on hand to show support for the MSFA bill, and to respond to questions about whether sales tax calculation and collection can be done without causing a burden on retailers. The answer is an emphatic ‘YES’ . TaxCloud is our free, easy-to-use sales tax calculation and remittance service for retailers. It’s the only service created solely to comply with the Streamlined Sales and Use Tax Agreement (SSUTA) at a scale to support all internet merchants. Here’s a picture of David with Representative Bill Delahunt.